PC Life Cycle Management starts from provisioning the desktop by deploying the OS to retirement. 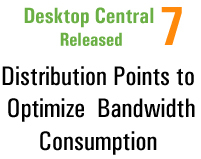 While Desktop Central takes care of administering the desktops post OS deployment like Software Installation, Patch Management, Asset Management, Configuration Management, and so on, the missing piece is the OS Deployment part. ManageEngine OS Deployer fills this gap with its centralized disk image capturing and deployment capabilities. It does not just stop with deploying the OS; it goes a step ahead with integrating with Desktop Central by automatically installing the Desktop Central Agents in all the newly provisioned computers. The new computers will automatically become the part of the managed computers, without requiring any additional configurations in Desktop Central. Centralized Image Capturing - Capture the image of both live and shutdown computers and store them centrally in a network share or other portable media like CD ROM, Flash Drives, etc. Role-Based Deployment Templates - Create templates for various employee roles/departments with customized deployment settings. OS Deployment - Deploy OS images to multiple systems with flexible deployment options. Post-Deployment Customization - Customize the network settings, computer name, transfer/execute files, etc., post-deployment. Deploy to Dissimilar Hardware - Automatically include the required drives while deploying images to dissimilar hardware.